This is the easiest salmon you’ll ever make. Seriously. You could practically do it with your eyes closed and one hand tied behind your back. T and I made this a couple of weeks ago when we were on vacation. Luckily we weren’t planning for lunch the next day because T practically licked what was left of the glaze right out of the bowl! In a sauce pan, bring vinegar and honey to a boil. (Be sure to open a window (in my case) or turn on your vent fan– this stuff is potent when it heats up!) Reduce heat and simmer for 5-10 minutes until vinegar thickens enough to coat the back of a spoon. There’s a very fine line between “perfect” and “burnt vinegar”, so don’t walk away from the stove during the last few minutes. And remember, it will thicken as it cools. Remove from heat and set aside. Lightly season salmon with salt and pepper. I highly recommend wild caught salmon. It has a much deeper, rich colour, and the flavour is so much better! Once you go wild, you’ll never go back. 🙂 Place in pan over medium high heat and cook until flesh is opaque, turning once. Don’t over cook! If there’s a little pink in the middle, remove it from the pan. I’ll continue to cook for a few more minutes. Once balsamic vinegar has cooled, whisk in 1 TBS olive oil. 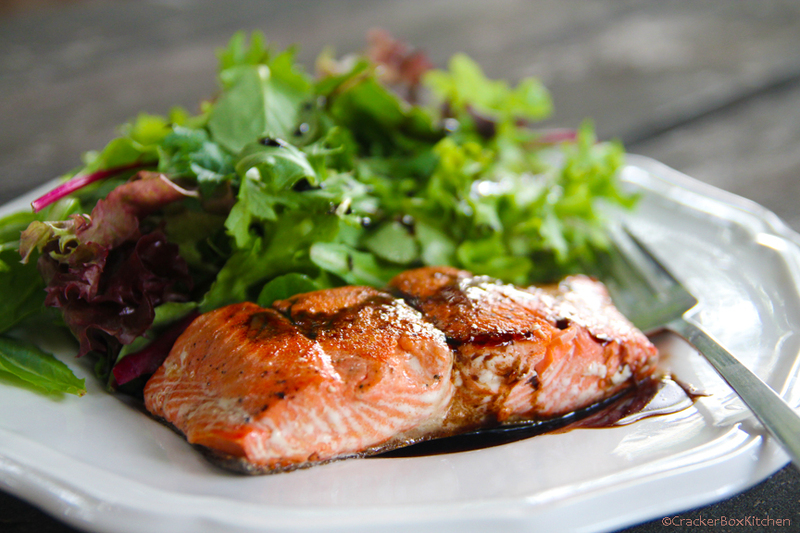 Plate salmon with mixed greens, drizzle with balsamic glaze, and serve! It’s been a few months since my last post. In the mean time, I’ve gotten engaged, started planning a wedding, and moved!